If you want to take your game to the next level, you have to get faster. Next to skill, speed is one of the most game-changing qualities you can possess. While some people may be naturally fast, everyone can get faster – with the right approach. Here is how you can get your body moving faster than ever before. Aside from the sport of track & field, the key to developing dominating speed in team sports is to work on your acceleration. Rarely do team sport athletes have enough time and space to get to actually get to top speed. It doesn’t matter how fast you are if you cannot beat your opponent in a 10 meter sprint. One of the cool things about acceleration is not only that it is the most relevant for team-sport athletes, but it is also the most trainable. If you are willing to put in the work, you will be rewarded with greater acceleration speed. Athletic performance boils down to how much force you can put into the ground and how quickly you can apply the force. The stronger you are in relation to your body weight and size, the easier it is to move your body. I have seen weaker athletes who are naturally fast when they have lots of time to get up to speed, but to build that game-changing acceleration speed, you have to be strong. This requires some serious effort in the weight room with low-rep, heavy sets of exercises such as squats and deadlifts. For more info on this, check out my post on The Secret to Athletic Performance. Also, checkout this video by famous Canadian Sprinter Ben Johnson. Ben could squat 3x is body weight and you can see for yourself the effect that had on his sprinting speed. Forget those out-dated myths about weights making you slow and muscle bound. The right type of strength training will make you fast! While there are a few sporting exceptions (e.g. football linemen, sumo wrestling, super-heavy weight class powerlifting & weightlifting), in most sports, leaner is better. Fat is dead weight that slows you down. When you get leaner, everything gets better – especially your speed. The most important thing to get lean is to clean up your diet. If you want to train to get leaner (which will also make you faster), you need to do this in an athletic way and avoid mainstream fitness fat loss methods (e.g. traditional cardio) which make you slower and less athletic. 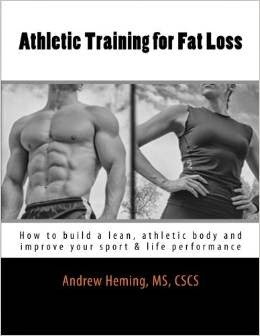 For a complete guide to getting athletic lean, check out my book Athletic Training Fat Loss. In addition to strength, working on your explosive power is also important for maximizing your speed. Exercises such as Olympic weightlifting variations, weighted or un-weighted jumps and med ball throws can all be helpful for building explosive power. See my YouTube playlist on Speed, Power, Jump and Agility Exercises for ideas. For many athletes, the concept of quick feet is drilled into them. Many youth sport programs include things like ladder drills and huge emphasis on quick feet. However, as one who has done a lot of speed and agility testing over the years, I can say with confidence, that our fastest athletes in short sprints and agility drills are the ones who take the least number of steps. Note: taking fewer steps is not accomplished by reaching farther with the front foot to get a longer stride. This is called over-striding and it actually has a breaking effect that makes you slower. Rather, the trick to taking less strides it to apply more force into the ground so that each powerful stride propels you a greater distance. When you are sprinting a set distance, count how many steps it takes and work on gradually reducing your steps. Also, check out my related post on The Truth About How to Get Quick Feet. To produce maximal force, you need to get and stay tight. To produce maximal speed, you need to be loose. The trick with sprinting is to get the optimal balance of tightness and looseness. Many times, athletes try too hard when they are sprinting – especially if they are being timed and this slows them down. My assistant strength coach (who is a former sprinter) saw me running sprints one time and told me I looked tight. The next set tried to relax more. Even though I felt like I was going slower, I actually had a better time. Note: if you have access to an electronic timer – use it. This allows you to experiment with different levels of tightness and looseness to find the optimal level for maximum speed! Also, if you will be tested on a timer, using one in training helps you get used to this so you are less nervous when you are tested. Torso lean. Note: Many people make the mistake of popping up at the start of their sprint. While you do want to be fully upright when you are at full speed, you need a good a forward lean during acceleration. Do your sprints at the beginning of your training session or at another time when you are fresh (note: one exception is that sometimes I will use heavy, low-rep, non-exhaustive strength exercises such as squats or deadlifts before a set of sprints. This tricks the nervous system into thinking the body is heavier than it really is and allows you run even faster). Keep your distances short. For team sport athletes, I usually use 10-20meter distances and would rarely go over 40meters. Keep your sets less than 10 seconds. Longer lasting sets can be helpful for building speed endurance or conditioning, but they will not make you faster. Fully recover between sets. Many athletes are used to a fast-moving pace when training and practicing. I have seen athletes run a sprint, jog back and then start the next sprint. This is excellent conditioning, but useless for speed training. After each sprint, give yourself a good, long rest (a little longer than you think you need). I tell my athletes they need to be lazy between sets. You need to fully recover so that each set of sprints is as fast as you can possibly go. Enjoy getting faster and dominating your competition! Andrew, this is mind-blowing. Very insightful. I was especially enlightened by the "Learn to take less steps" section. I have been strength training effectively for over a year now and, really, for the first time in my life at age 33! I wouldn't consider myself a runner, though I like to run on the treadmill to warm up before a weight session. Apart from weight lifting, I like to do a weekly spin class (a real one that is cycling-oriented only, no useless arm exercises... great interval and endurance training). This year my son joined a soccer club at his school. Every week, the coach ends the session with about a 20-minute game involving parents versus kids. I can't tell you how surprised I was with my sprinting ability. I have never before been able to sprint like this in my life, even in my teen years or in my twenties (regardless of regular "exercise"). The other parents playing on the field commented to me, "Vesna, you are here, you are everywhere!" I could switch from defines to forward/offense in a few seconds. I was surprised at my unprecedented ability to propel myself, and it felt great! I am positive that most of that can be attributed to my commitment to the weight room. I'm in love with squats and deadlifts, Bulgarian split-squats and really everything that I've been doing and learning for the past 15 months, including HIIT conditioning exercises like burpees, jump squats interspersed in my program here and there. So this rather long-winded comment is just to say that my experience tells me you are absolutely right. I do not consider myself a sprinter, because it's not in my regular exercise program yet (because of spin class, etc. ), but I think I may try it with my brother now, because it's crazy, but after all this training, I DISCOVERED that I can already do it! Amazing! Thanks for the excellent article--as always! Cheers! Thanks for your kind words Vesna. Glad you enjoyed. Yes, even for the non-competative athlete, athletic-based training offers tremendous benefits for pick-up games, recreation and read life.